My guest today is Mark Foraker, Director of Development and Communications for Manna Food Center, in Gaithersburg, MD. Welcome to OpEdNews, Mark. Your food bank is located just north of Washington, DC. Montgomery County has been identified by Forbes as one of the most affluent counties in the US. So, why are you there and does that mean there's not much for you to do? Unfortunately, we have plenty to do. Montgomery County is a perfect example of hunger amid abundance. You are correct that this is one of the wealthiest counties in the nation yet 35% of Montgomery County Public School (MCPS) students receive Free and Reduced Meals (FARMs) through their schools, and 43.3% of current MCPS students have participated in the FARM program at some point. Hunger is certainly an issue in Montgomery County when more than a third of our public school students are at risk of hunger and experiencing food insecurity. Approximately two-thirds of the people we serve are those who are commonly referred to as the working poor. The slightest unexpected event such as an illness, a dental issue, or a car repair will exceed their monthly budget. This often places families in a situation where they must choose between spending money on food or paying an essential bill. We believe that people cannot climb out of poverty on an empty stomach. We are here to help remove food as a barrier for families working towards self sufficiency. On average, we provide food to nearly 3,760 households a month and give food to 2,300 elementary school children every Friday. That is a lot of people coming to us for a very basic need. Agreed. Sadly, there are a lot of people, far too many, living on the very edge. Tell us about the Smart Sacks program. How does it work? The Karen Goldberg Smart Sacks program (Smart Sacks) began in 2005 as a response to children in our public schools who were showing signs of hunger when returning to school on Monday mornings. These students were receiving meals through the FARMs program at their school but that is not available on weekends. This program ensures that these children will have access to food when school is not in session. The idea is that they will return to school on Monday, properly nourished and ready to learn. That goes back to our philosophy of removing hunger as a barrier to success. One of the great aspects of this program is that it is a collaborative model. Manna staff design the menu, acquire the food, and manage and evaluate the program. Community partners pick up the food and supplies from Manna, pack each bag and deliver it to the schools for distribution. The schools identify the participants and distribute the food on Fridays. In 2005, the program served 500 students providing backpacks of "kid friendly" foods. Today, we serve 2,300 students in 58 elementary schools every week and are focused on a healthy, nutritionally balanced menu. The idea is that we are not only addressing hunger, but increasing access to healthy foods and taking greater responsibility for the nutritional content of the food we provide. Our Director of Nutrition Programs is a registered dietitian and she is focused on constantly improving food quality and access for those we serve. That sounds wonderful and I love the collaborative aspect, too. Give us an idea of the need out there. How many school kids could you be providing Smart Sacks for? What limits you - time, resources, space? We have plans to expand by 120 students per year into the foreseeable future. Expansion is limited by several factors including community partner commitment, school participation and, of course, food resources. There are other similar programs in the county, but what makes our service unique is that we focus on elementary schools and provide a specific nutrition-focused menu. Committing to a specific menu has ensured greater access to healthy foods for our students but also raises the cost and complexity of the program. Ensuring that 2,300 students receive the same menu every week is a challenge and is not easily done on donated food. Therefore, we must purchase more foods for this program thus increasing cost. I do not know the exact number of elementary school students in need, however, there are nearly 54,000 students participating in the FARMS program in the county. All of these students certainly could benefit from programs like ours. We are now working more closely with organizations providing similar services in the county so we can avoid redundancies and ensure greater coverage. We are not addressing this issue alone, collaboration extends beyond our program partners to other nonprofit organizations in the county. 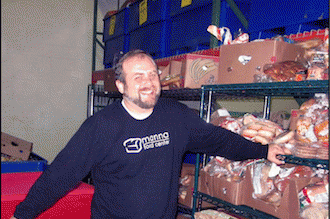 Can you tell us a bit more about Manna Food Center - how and when it got started, for instance? Manna Food Center opened its doors in 1983 to address hunger in Montgomery County, Maryland. Prior to that time, families and individuals in need of food would seek support from the County as well as food pantries that were largely run out of churches, synagogues and other places of worship. The resources available were limited and not sufficient to meet what seemed like a steady growth of hunger and food insecurity. Government, community and faith leaders knew that an organization, dedicated to fighting hunger was needed to properly address this growing concern. The time was right as Food Banks were increasing in popularity throughout the nation in the 80s; for instance, the Capital Area Food Bank was founded in 1980. Our founders had great foresight when naming us Manna Food Center. At the time, their intent was not to replace the work that was being carried out in the county by the food pantries and other groups, but to enhance it. Their intent was to create an organization that would be the center of ending hunger in the county and we carry that on today. When you look at our origins and growth, I find it fascinating that we opened our doors in 1983 with a donation from Giant of 16,000 pounds of food. Fast forward 31 years and that is approximately the same amount of food that we distribute every day. I think we are in an exciting stage of our organizational development. We continue to meet an increase in demand for food. We also have a greater focus on nutrition and food quality and no longer think about our work just in terms of food in and food out. We believe that you can't climb out of poverty on an empty stomach and that ultimately, we cannot end hunger amid persistent poverty so we continue to collaborate and improve our process. Terrific. How did you get hooked, Mark? What brought you to MFC in the first place, how long have you been there? Share, please. View All 45 Articles in "economic inequity"
Other Series: View All 9 Articles in "Food"
Other Series: View All 24 Articles in "health"
Other Series: View All 3 Articles in "Hunger"
Other Series: View All 49 Articles in "positivity"
Other Series: View All 5 Articles in "poverty"